Fresh water is essential to pet health, so it is important to make sure your dog always has a supply of clean water. A pet water dispenser or automatic dog waterer can ensure the ready supply of clean and fresh water that is essential for your pet’s long-term well-being. A water fountain or a gravity water feeder can hold the appropriate amount of water your dog might need, and accessing it shouldn’t be an issue, especially if your family pet is accustomed to an automatic dog feeder. Dogs catch on quickly that the dog water fountain is their go-to source for clean water. 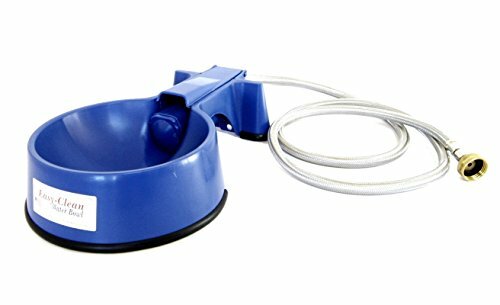 Any pet owner with a busy schedule or one that requires them to be away from home for a significant amount of time will appreciate the convenience of a pet fountain over a dog water bowl. No more worries about your pet remaining thirsty due to an overturned or spilled water bowl, or having to refill the water bowl throughout the day. Your pet can drink when they want and as much as they want. Pet parents can pick from a range of water dispensers that will meet the needs of their dogs as well as their own aesthetic and budget requirements. Most currently available fountain water dispensers are made of stainless steel, BPA-Free plastic, or ceramic, and are dishwasher safe, so cleaning them won’t be a problem. Our top pick is PetSafe Drinkwell Platinum Pet Fountain because it gets the job done and can accommodate multiple pets of varying size. At just north of $40 it’s also reasonably priced, the components are easy to disassemble for a weekly cleaning. It may not meet everyone’s needs though, so keep reading for the full list of our selections. 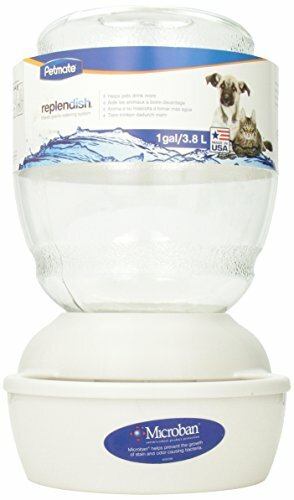 Does My Pet Need a Dog Water Dispenser? How Do I Pick the Right Type of Dog Water Dispenser to Suit My Dog’s Size and Water Requirements? What Do Water Dispensers Cost? Dogs can develop a variety of health problems if they drink insufficient or contaminated water, and, as a pet owner, you definitely want to avoid that scenario. 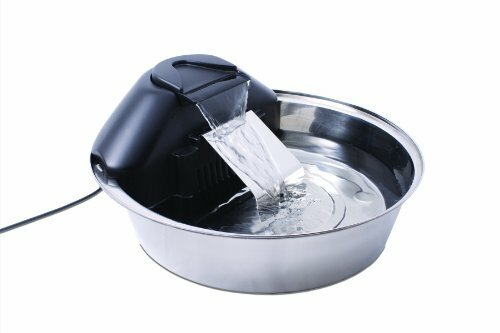 Dispensers like a pet fountain, a gravity dog waterer or an automatic water feeder provide your pet with adequate clean water even when you are away. The foam or charcoal filter in a dog water fountain or a gravity water feeder catches impurities, and the continuous circulation in a pet fountain keeps the water well oxygenated and free of slimy build-up. Apart from a water fountain, a portable dog water bottle is useful to take along to quench your dog’s thirst on long walks or hikes. A water bottle is also more practical than a plastic, ceramic, or stainless steel fountain in a crate, especially if your dog needs to be confined for a lengthy duration. By veterinary recommendation, your pet needs one ounce of water for one pound of its weight. Of course, this varies by an individual dog’s preference, size, age, and health condition, but it gives a basic idea about the amount of fresh water your dog should be drinking daily to stay well-hydrated. Get a dog water fountain with a larger reservoir capacity; it is better to have more water than less. Your pet is drinking sufficient water if they are bright-eyed and active, with a healthy, elastic skin. Tug gently at the dog’s neck to check if the skin retracts immediately in place. If it doesn’t, your dog can have a dehydration problem. Other signs of trouble include tiredness, reduced urination and bright yellow urine, and drinking too much water. Dog water dispensers come in a range of prices, from the affordable to the very expensive, depending on the type of dispenser, design features, material, size, and manufacturer. Do your research and you should be able to find the right dispenser for your budget. Keep in mind that large dogs require a greater amount of fresh water to drink than smaller dogs, and choose a dog water fountain, a gravity water feeder, or a dog water bottle with sufficient capacity to fulfill your pet’s water needs. Does your pet spend more time outdoor or indoor? It doesn’t have to be an either/or issue, of course, you can buy dispensers like a water fountain or a water gravity feeder for both areas. Get a dog water bottle if you travel with your dog or participate in outdoor activities. A charcoal filter and a foam filter keep the water fountain clean and free of contamination. You will need to change these purification filters periodically. When purchasing a water dispenser, check if replacement filters are readily available and what their price range is. Dog water dispensers come in ceramic, BPA-Free plastic, and stainless steel. Each have their merit with regard to durability and maintenance. If your dog has the tendency to chew everything in sight, go for a ceramic or a stainless steel bowl as both are sturdier and not as appealing as plastic to dogs for scratching and chewing purposes. Can the dispenser hold enough water for your dog? If your dog needs a lot of water or if you have multiple pets, it will help to have an automatic water dispenser with a larger reservoir and adjustable water flow controls. allows several pets to have a drink at the same time. Dog hair, bits of food, dust, and other debris can accumulate in the dispenser and so regular cleaning is required. Check if the water dispenser is dishwasher safe, or if hand-cleaning is required. Do you need to disassemble the components for cleaning? Are there any hard to clean areas in these components? As importantly, will you be able to reassemble the parts without too much trouble after cleaning and get the dispenser working again? Is the pet water fountain, dog water bottle, or automatic water feeder robust enough to withstand the attentions of curious or rambunctious pets? Are replacement parts available in case of any damage? Make sure that the electric dispensers have chew-proof power cords. 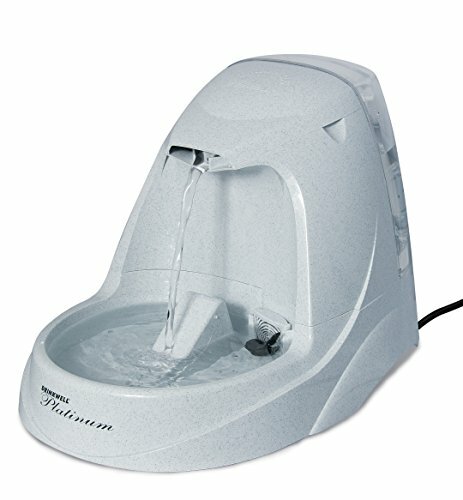 Is the water fountain designed to let your pet drink easily? Does it appeal to you aesthetically? Fountain dispensers, dog water bottles, and gravity water feeders come in a variety of designs and colors, so finding one you like shouldn’t be difficult. falls within your price range. Gravity dispensers don’t require electricity, just good old gravity, so you don’t have to worry about your pets chewing up power cords. The basic set-up is an upside down reservoir bottle fixed into a water bowl base. Water trickles into the drinking bowl from an opening in the bottle cap until the water level in the bowl rises above the cap opening. Then the flow of water stops and only continues after your pet has drunk from the bowl and lowered the water level again. This happens because air replaces water in the empty space at the top of the reservoir and when no further air can get past the water into the space, a low-pressure area forms. The resulting suction effect on the water prevents it from leaving the reservoir until the water level in the bowl has gone down. A pet fountain is electric powered and has a submersible pump that keeps the water circulating. The water flow of the free-falling water stream is controllable, and the water fountain is generally quiet and unobtrusive. Pets can drink from the water-streams or from the drinking bowl. Clearing the pump of any debris and cleaning the stainless steel, plastic, or ceramic bowl on a weekly basis is sufficient to keep the fountain unit in a good working condition. to a garden hose or any other water source and fill the water bowl. flush toilets, so there is little chance of the bowl overflowing. Automated dispensers are suitable for both small and large dogs. and have a drink of water whenever they want. These types of dispensers may also work well in dog kennels, as, depending on the design, they may be able to clip to the fencing. The stainless steel 360 design of the Drinkwell Pet Fountain, with a 128 oz. 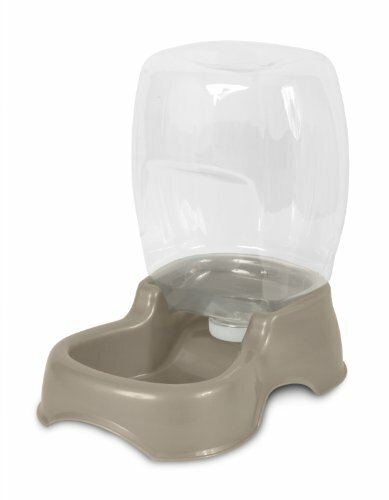 capacity, allows multiple dogs to drink from the fountain bowl at the same time. You can customize the number of streams from one to five and also increase or decrease their water flow rates. The submersible pump is quiet and the water fountain’s receiving ramp reduces the noise of the water stream to a gentle tinkle. Cleaning the pet fountain pump and the stainless steel bowl once a week, and changing the foam filter once a month should keep this fountain in good condition. With a 70 oz. 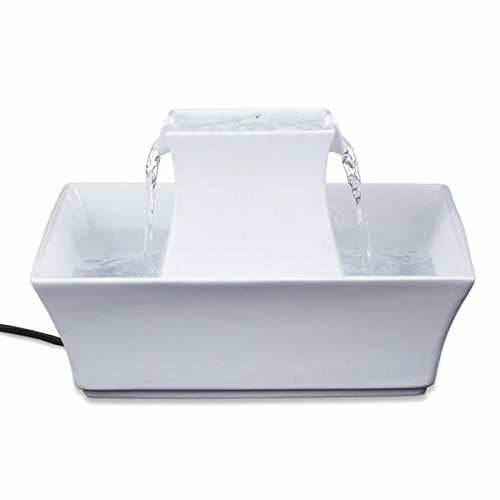 water capacity and dual falling streams, this ceramic fountain is a good choice for multi-pet households. If you are looking for a silent dog water fountain, however, this isn’t the pet fountain for you. There is no ramp for the falling streams in the bowl, so splashing sounds are inevitable. The pagoda design is attractive though and should make a welcome addition to your home. The 168 oz capacity reservoir of this dog water fountain can water your pet for a week at least. If you have multiple pets, you will need more frequent refills or a pet fountain with a larger reservoir. The submersible pump of the pet water fountain is fairly quiet, unless the water level has gone down, and the flow rate of the water fountain stream is adjustable. The circulating water prevents bacterial build-up in the bowl and fountain, but you will have to disassemble and clean the fountain components once a week to remove any accumulated debris. Changing the charcoal filter once a month will ensure fresh, odorless, clean water. Made from durable, BPA-Free plastic, this 50 oz water fountain is ideal for small dogs. Depending on the number of pets you have and the amount they drink, you may have to fill the water feeder once or twice a week. Keep the pet fountain pump submerged, or it can burn up. The fountain is dishwasher safe. Sturdy and attractive, with a 60 oz. capacity, this ceramic drinking fountain works for households with small or medium-sized pets. 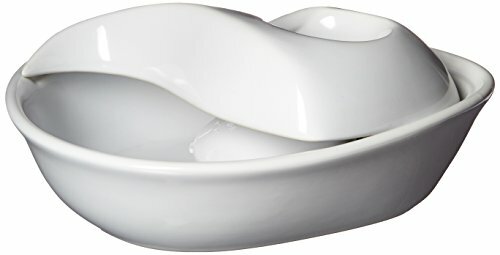 The teardrop shaped drinking bowl and the water flowing from the top will allow one or two pets to drink at a time. It is dishwasher safe and easy to keep clean. You only have to disassemble the three parts and put them back together again after cleaning. With a 128 oz. water capacity, this dishwasher safe pet fountain is ideal for multi-pet households with both small and big dogs. 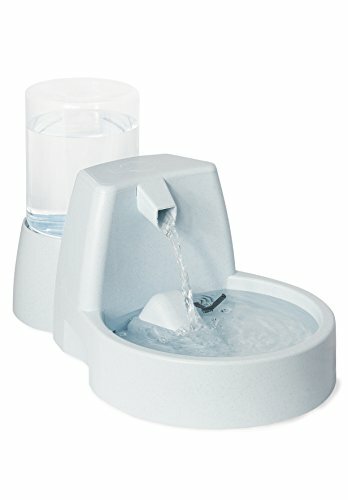 The fountain is made of BPA-Free plastic and the drinking bowl is of stainless steel. The recieving ramp reduces the sound of falling water. This gravity water feeder is made from 95% recycled, BPA-free plastic. 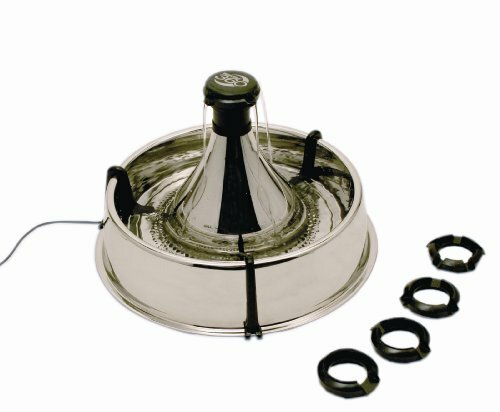 The reservoir cap contains the charcoal filter, and the opening allows water to flow slowly from the reservoir into the drinking bowl, without overflowing. Replendish comes in 0.5 to 4-gallon sizes. The 1/4 gallon water capacity of this gravity water feeder makes it suitable for medium-sized dogs. You may have to refill the water once a week, depending on how much your pet drinks or how many pets you have. 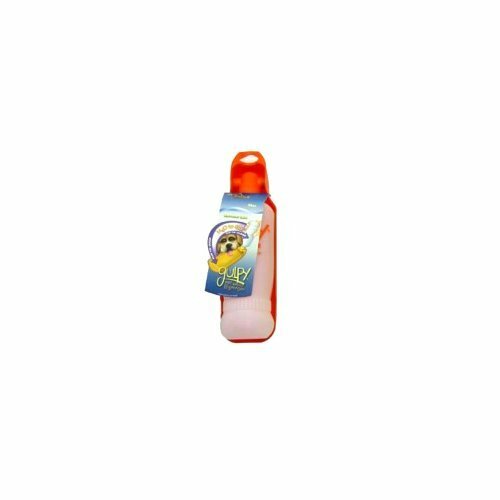 Clean the bottle and the bowl before each refill, both easy tasks as the bottle is wide-mouthed and the waterer has a smooth finish. 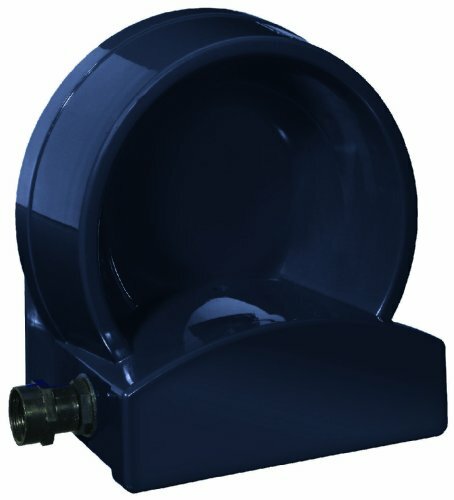 Connect this water feeder to a garden hose. The float system regulates how much water you want in the drinking bowl and prevents overflow. You may want to fix the dispenser to a wall or a floor to keep it from overturning. Clean the dispenser weekly to remove debris and bacterial build-up. 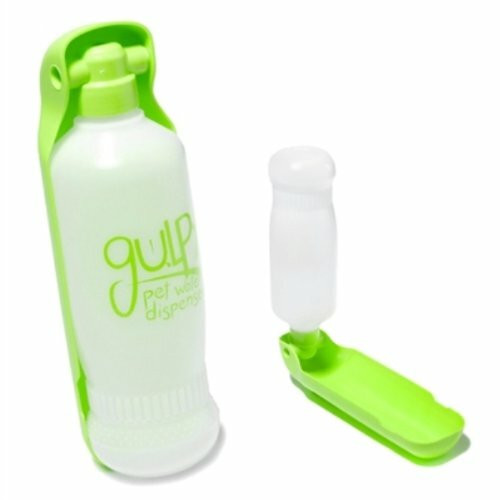 The Gulpy water dispenser is a handy dog water bottle for trips, walks, or hikes. Flip open the detachable tray bowl and squeeze the bottle to pour out water. With a 10 oz. capacity, the bottle is appropriate for small dogs. This 44 oz., flat-sided dog water bottle can be attached to the outside or the inside of a dog crate and adjusted for height. The flip-top lid makes it easy to fill in water, and the ball-tipped valve prevents dripping. A pet fountain allows your dog constant access to fresh water, whether you are at home or out. You can monitor the amount of water your pet drinks and can take immediate measures if there are signs of health problems. For these reasons, a dog water dispenser is well worth the investment. Go on–give Clifford a cup of cold water! Still feel like you need more information? Check out Gun Dog Supply to view FAQs and other available dog water dispensers.